“King Pascal” begins with the group on a makeshift boat, trying to remain calm as a storm comes. Rapunzel gives everyone tasks except for Pascal, who she urges to hide below deck. The chameleon sees that the jib of the mast is loose and tries to re-tie it, but ends up falling and being knocked unconscious. When he wakes up, everyone is stranded on an island and Rapunzel is thrilled to see him. Rapunzel and Cass challenge the men to a contest to see who can build a better shelter faster. When Eugene points out that that makes four men against the two women, Rapunzel retorts that they have Maximus, again leaving out poor Pascal. After changing into island-appropriate clothing, Rapunzel fashions a grass skirt for Pascal, incurring more teasing. They go out for materials to make a door for the new shelter, but a group of tiny people begin following them. They end up in a cave where the small people reveal that they believe Pascal is their god, who they call Lizardus. They carry Pascal away, and the girls follow them, failing to notice a cave painting indicating that Lizardus is supposed to fight off a beast. The people’s city has all of the lanterns from Rapunzel’s birthday celebrations. They’re afraid of bugs, and are thrilled as Pascal begins eating them. Rapunzel and Cass are treated as servants for Pascal, a development that wears thin rather quickly. Rapunzel eats a local fruit which turns out to be a hot pepper. She tries to get Pascal to leave with her, but he eschews the offer in lieu of the treatment he gets from the little people. Meanwhile, throughout “King Pascal,” the guys fail to build a functional shelter. First, they build one that is ultimately carried away by ants; then Shorty demolishes the second attempt. The girls catch sight of the Firefly Pascal is supposed to fight, which is really a huge fire-breathing bug. Rapunzel apologizes for the way they’ve been treating Pascal, and they help Pascal fight the insect. Eugene and the guys also show up and offer aid. Rapunzel realizes that the bug isn’t evil; it’s just breathing fire from eating the local peppers. She grabs some “stinky weed” to cure the bug of the burning, which Pascal delivers by jumping inside its mouth. Of course, it all works out; the bug is OK and spits him back out. Everyone stays in the girls’ hut. 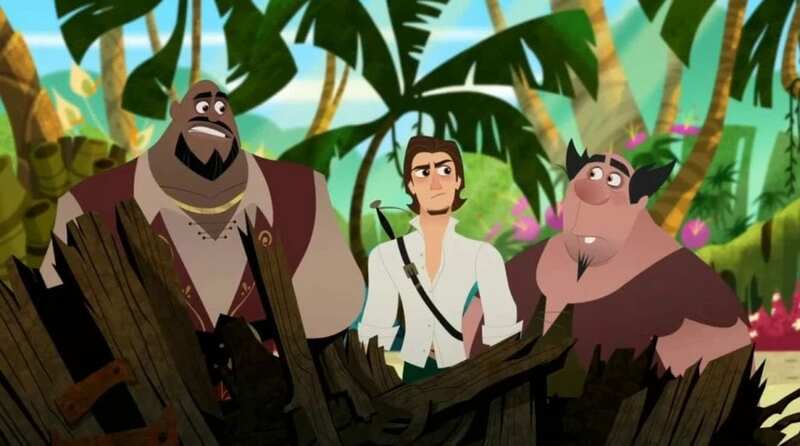 “King Pascal” reminds me of an episode from the first season, “Pascal’s Story.” In that episode, Rapunzel neglects Pascal, spending all her time with Cassandra and Eugene. Pascal leaves and goes back to the tower in which the two grew up, only returning with Rapunzel after she tells him what he means to her. In both cases, this feels very out of character for Rapunzel, who is caring and loyal to a fault. However, in “Pascal’s Story” it still works better because the episode is emotional and Pascal is sympathetic. The exploration of the relationship between the two in that episode is very sweet and genuinely good to see, even if they throw Rapunzel under the bus for Pascal’s sake. “King Pascal” is a silly episode, though I don’t find its attempts at comedy to be very amusing. Again they make Rapunzel act like a completely different person just so they can have her learn to treat Pascal with respect and like an equal member of the team, which they’ve already done, even if it wasn’t totally unnecessary to begin with. These two have a great relationship in the first movie, and as a consequence, Pascal is one of the best sidekicks Disney has ever had. I don’t understand their choosing to explore these scenarios in the series, where Rapunzel neglects him and he rebels. It’s like bad fanfiction on the screen. I will say that Rapunzel’s island dress in “King Pascal” is very pretty, and it’s nice to see her in something other than pink and/or purple for once. 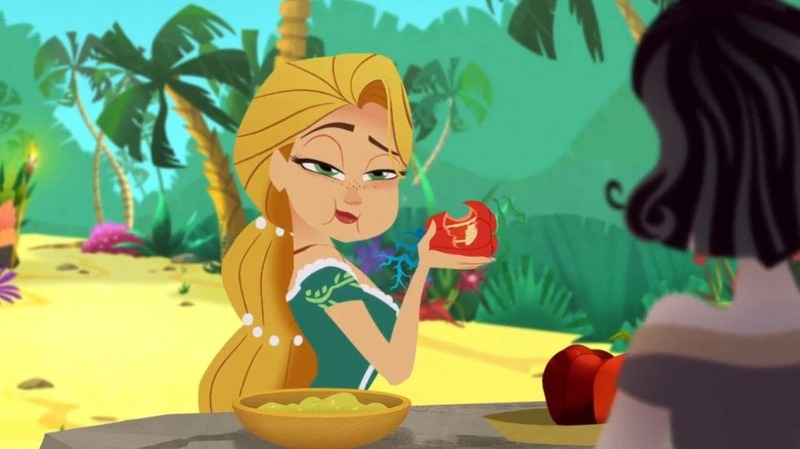 They never explain how or where Rapunzel gets this dress, and although they do that a lot in this show, this time she’s stranded on a jungle island, so it’s harder for me to imagine her sneaking off and buying something to wear. And the group’s supplies were destroyed when they crashed, so I don’t think it’s something she already had either. Cass’ outfit appears to be a modified version of her usual gear; she probably just cut the sleeves and rolled up the pant legs for comfort. The guys also simply modify their existing outfits. Why give Rapunzel a completely different dress? I love the wardrobes in shows/movies like this, but in this case, it makes no sense. The little leaf people are ridiculous, and not funny at all. Like Calliope, they seem to be designed to be annoying. And what are they? This race of tiny, leafy people existing in this universe doesn’t seem right. I can’t imagine these guys in the first movie. And why do they have German accents? Rapunzel’s fictional country of Corona is based on Germany, but nobody there has this accent. These guys are a random, small group of freaks stranded on an island and they all have German accents? “King Pascal” feels like another filler episode where the writers had no idea what to do, so they basically copied the subplot in Return of the Jedi where the Ewoks think C-3PO is a god. Just what all the Tangled fans wanted, right? I feel like a broken record, but every week I just wonder what the hell these people are doing. What does this episode have to do with the first movie, or either of the season premieres, or even last week’s episode? Why does any of this matter? Why show it? I could forgive the series’ stupidity and lack of interest in its own plot and characters if it were fun, but it’s really not. The jokes fall flatter than Cassandra’s personality, and this show’s idea of adventure is a fight between a bug and a chameleon. I don’t even know what to say about that, because the absurdity therein speaks for itself. There’s a joke about Rapunzel’s nose on a statue of her that’s not funny at all. This could have so easily been fixed by tying it in to a similar joke in the film. Rapunzel could have simply said Eugene’s line from the first movie, and to me, that would have been much funnier. Rapunzel’s Tangled Adventure lacks direction and purpose – ironic, given the repeated mentioning of Rapunzel’s destiny. In short, “King Pascal” is another stinker. At this point, I feel like I’m saying “skip this one” so much I might as well recommend skipping the whole season! This year’s premiere was great, but not a single episode since has surprised or impressed me. I was originally looking forward to this series and was sure I’d love it, but by now I get more joy from reviewing it than watching it. I can’t in good conscience recommend it to anyone, not even kids; your kids deserve better than this. I wish Disney would make a sequel with the original directors because maybe they’d actually try to keep the characters and worldbuilding intact. These people clearly don’t care. I’d recommend the first movie or the Big Hero 6 TV series before this loser. Rapunzel's Tangled Adventure - "King Pascal"
In short, “King Pascal” is another stinker. At this point, I feel like I'm saying “skip this one” so much I might as well recommend skipping the whole season! This year's premiere was great, but not a single episode since has surprised or impressed me.